Hello there, and welcome back to our blog. In our recent post, we began looking at some of the common injuries related to car accidents, and how chiropractic care can help treat these injuries. Today, we would like to shift our focus to Lyme Disease, a common infection found here in Colorado and across the United States. According to the Centers for Disease Control (CDC), there has been a steady rise in both probable and confirmed cases of Lyme Disease in the U.S. over the last twenty years, with close to 30,000 confirmed cases of the disease reported in 2015. While the infection doesn’t show any signs of slowing down, recognizing the early symptoms of Lyme Disease can help Lyme-literate doctors, like Dr. Robert Arne here at Arne Wellness Center in Littleton, incorporate natural medicine with chiropractic care to treat, manage, and help patients recover from Lyme Disease. Let’s begin exploring some of the most common symptoms of Lyme Disease in part one of our long blog series. Please continue reading below. Lyme Disease is an infectious disease which is transmitted through ticks carrying a type of bacterium called Borrelia burgdorferi, frequently carried by deer ticks. An infected tick carrying the bacterium can transmit the infection to humans and animals in bites. Lyme Disease treatment is crucial; when the disease is left untreated, it can lead to health issues such as depression, hyperactivity, psychosis, rapid mood swings, seizures, hyperactivity, and fits of rage. When diagnosed early on, Lyme Disease can be treated in a variety of ways, combining natural medicine and such treatments as chiropractic, acupuncture, and other methods to treat and cure the disease. The onset of early symptoms generally develops within days to about four weeks after exposure to the infection. Circular, red rashes called Erythema migrans rash (EM), or more commonly, the classic “Bull’s Eye” rash manifest on the body. These rashes may appear small at first, as it occurs at the site of the tick bite, but will expand over the course of several days. 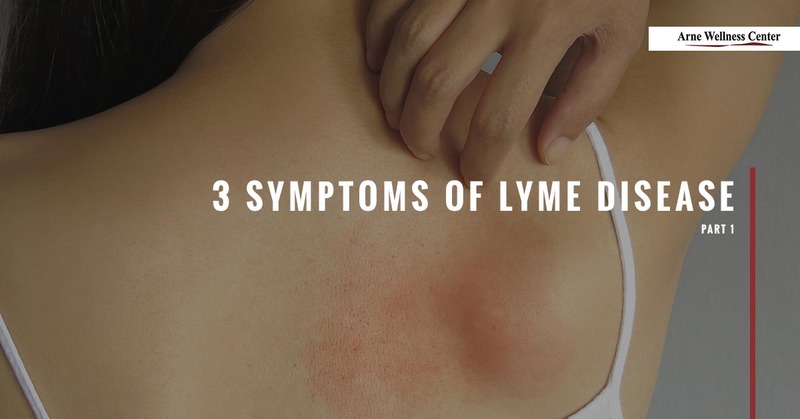 The rash may seem harmless because it usually isn’t itchy or painful, and will begin fading within four weeks of onset, even without Lyme Disease treatment. Another common symptom is swollen, painful joints which may occur at the knee, elbow, and elsewhere on the body. Early joint pain is similar to joint aches and stiffness that often accompanies the flu; however, according to Science Daily, “Lyme arthritis” may develop in the later stages of Lyme Disease. The joint pain and swelling which may develop later on may cause pain and stiffness similar to osteoarthritis. These are just a few of the early symptoms of Lyme Disease, which we will continue examining over the next several blog posts in this series. If you or a loved one are experiencing any of these symptoms, or have been diagnosed with Lyme Disease and would like to explore natural Lyme Disease treatments, please call Arne Wellness Center to request an appointment with Dr. Arne, who specializes in treating this disease. Please feel free to reach out if you have any questions.